Good news! 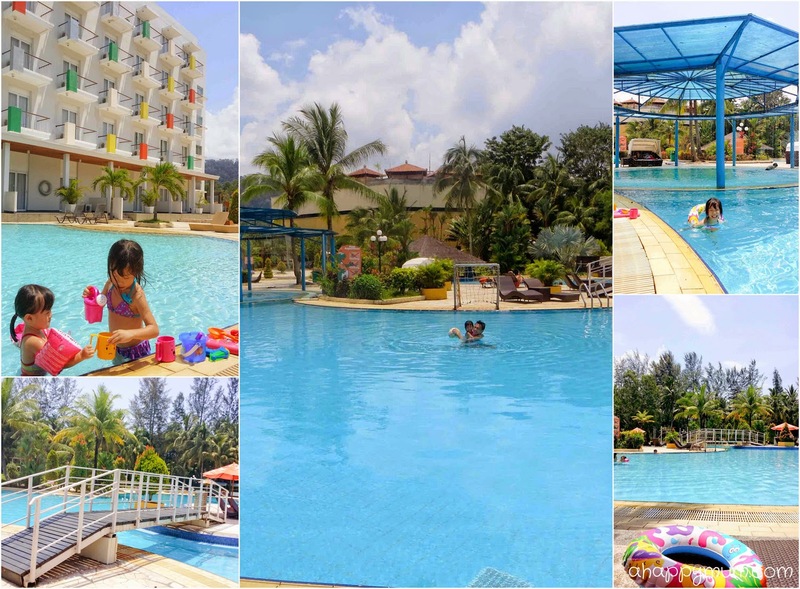 From 1 Nov 2014 to 1 May 2015, all A Happy Mum readers and friends will get to enjoy a 10% discount off your visit to HARRIS Resort Waterfront Batam. Simply go to this link and enter the promotional code 'ahappymum' when you make the booking. Terms and conditions apply. If you wish to upgrade to a family or suite room, please contact the reservation team at res-harris-batamwaterfront@tauzia.com or call +62 778 381 888. Don't forget to like HARRIS Resort Waterfront Batam on Facebook and follow them on Twitter! Everyone likes to go on holidays, am I right to say so? We are definitely the type of family who likes to travel to see more of the world and there are times when we just feel like going on a spontaneous getaway. The thing is, you can't really be that spontaneous in making bookings when it involves air tickets, car rental, week-long cruises or long road trips. So when we wish to go for a quick retreat, the first thing that comes to our mind is take the ferry and go to islands not that far from our shore. Of course, Batam has to be one of them. I remember when the hubby and I visited Batam as a couple, we would look out for things like beach resorts, water sports, spas, shopping, fresh seafood and late night parties. 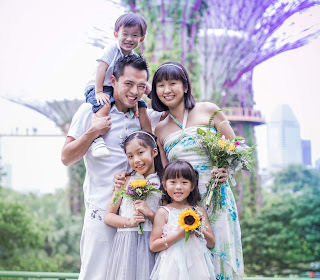 Now that we are parents with two kids, we naturally tend to think more for the needs and wants of the little ones and would prefer a destination that is more family-friendly. 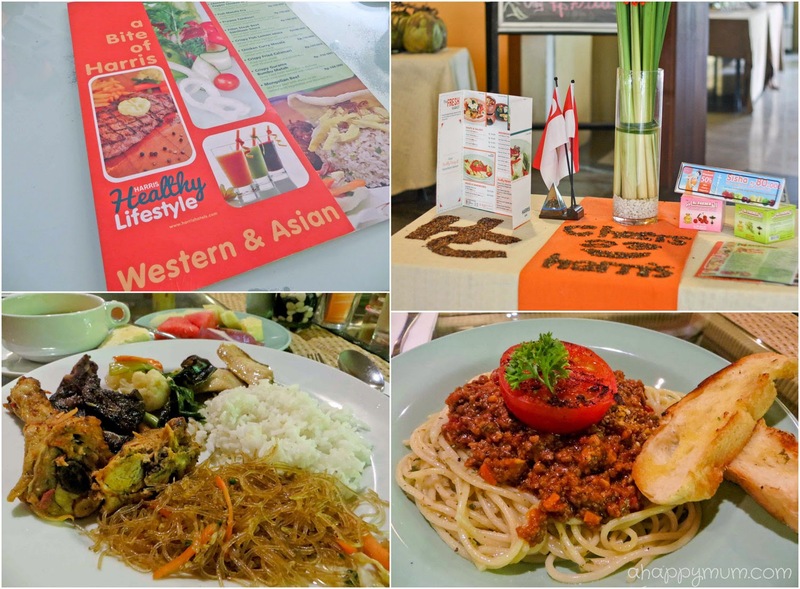 When we knew that HARRIS Resort Waterfront Batam was going to sponsor us a 3D2N family stay, you bet we were all thrilled because that meant packing our luggage and going on a much needed leisure trip. Today, I'm sharing with you all about our experience at the resort and the fun-filled activities we did! 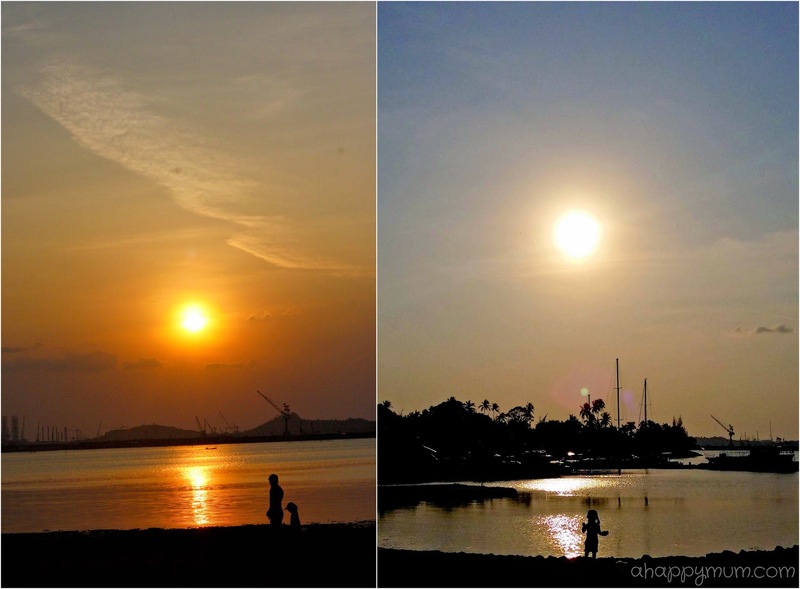 One good thing about visiting Batam is that it is really easy, convenient and quick to get there. The ferry ride takes only around 45 minutes! 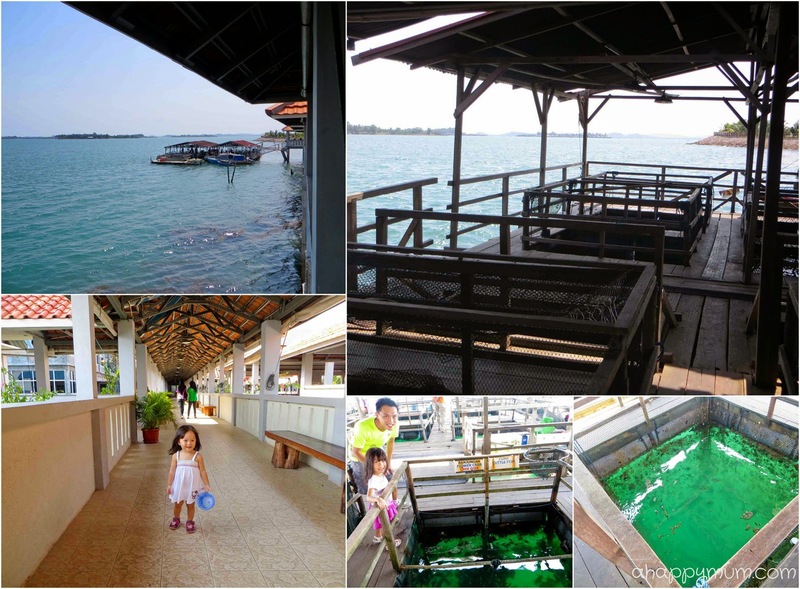 To get to Batam Waterfront, you would have to take the SINDO Ferry that departs from Harbourfront Centre. We booked our tickets only two days before but my advice is to pre-book especially if you are going on weekends or peak periods. 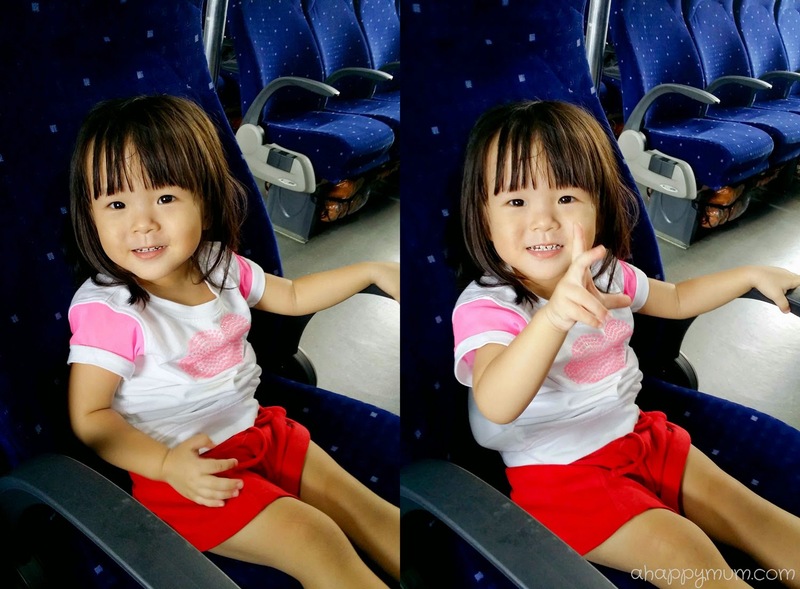 One return (2-way) ticket costs S$34 for an adult and S$24 for a child (0-11). From now till 31 March 2015, if you are a SAFRA member, you can enjoy S$10 off per adult for every return ticket. Once we got our tickets and deposited our luggage, we went for brunch at Toast Box and the kids were really excited to spot the vessel even though it was a far cry from the stupendous cruise liner we went on last year. The ferry arrived right on time and I must say it actually felt awesome to be travelling on a Sunday and to be departing when most guests were arriving. That meant, as you can see, we nearly had the whole ship to ourselves! I do think there are both pros and cons of visiting a holiday destination during peak and non-peak periods, don't you agree? I have to hereby remind you to hush the kids, as hard as it sounds, at the Batam customs as the immigration officers are now strict on enforcing rules and will deport any visitor who breaks the silence. We were lucky that there was no crowd when we arrived, therefore it took less than five minutes for us to be cleared. It would be sad to have to return to Singapore after all the anticipation for a fun holiday, right? The moment we got past the customs, we were greeted by the friendly staff of HARRIS, who was so kind to help with our luggage and lead us to the striking orange shuttle bus waiting outside. The shuttle service is a complimentary service provided for all guests and it only takes five minutes to reach the resort from the ferry terminal. Once we walked into the lobby, the kids were delighted to lay their hands on the refreshing welcome drinks and couldn't wait to take pictures with the dinosaur mascot. Even though our room was not yet ready till 2pm and we had to hang around, I must say everything got off to a great start. HARRIS Resort Waterfront Batam has a total of 308 fully renovated rooms in its old and new wings, including suites, residences and themed rooms like Japanese room and Beach Front Cabanas. We were lucky to get one of the eight Family Rooms located on the ground floor in the old wing and we absolutely loved every part of it. I can definitely say that this is one of our favourite rooms in all the places we have stayed in, and believe it, it's quite a long list! 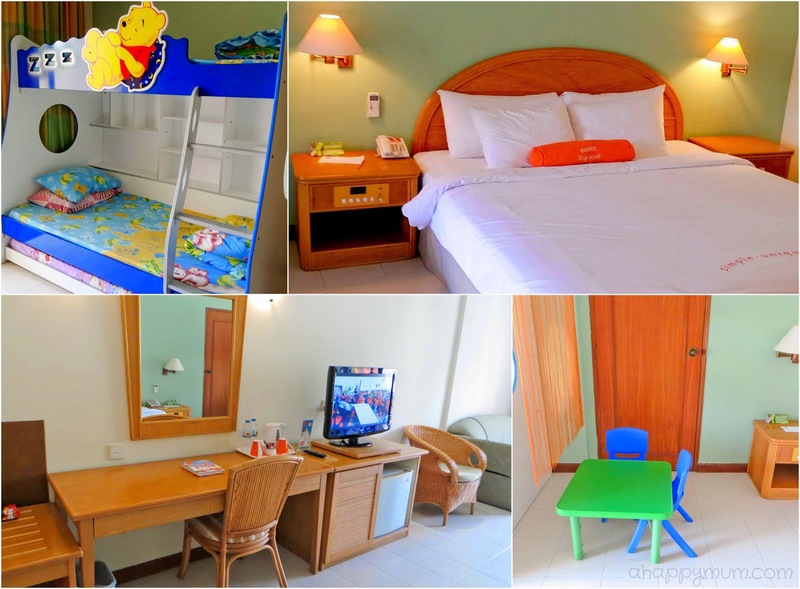 King-sized bed, double decker bed with pull out bed, couch, rattan armchair, bar fridge, huge closet, hairdryer, bathtub and even a cute table and chairs for the kids - we had all the amenities we needed and more. 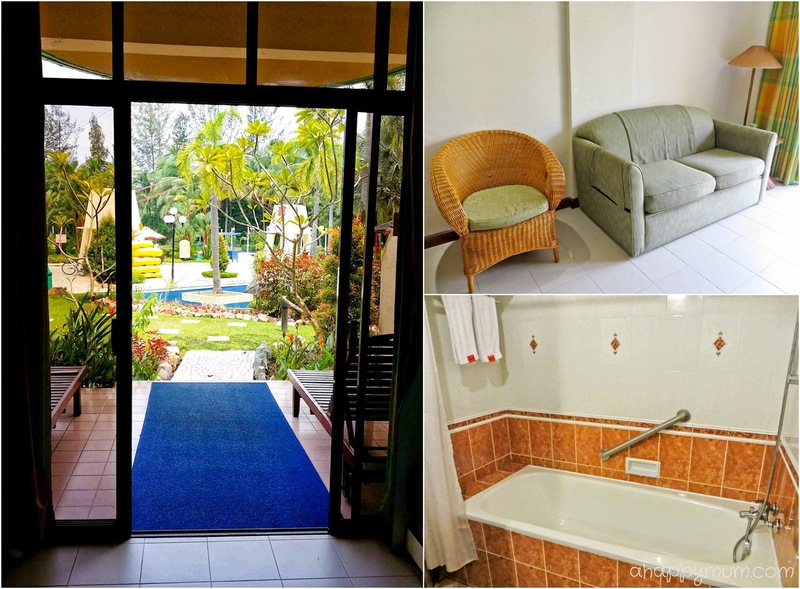 What I loved most about our room was the beautiful pool view and a glass door that opened up to the porch which was complete with deck chairs. You bet this made it convenient for us to go for a dip anytime! That said, I have to be honest and tell you that we did spot, and we did kill, a couple of mosquitoes in our room. You do have to treat this resort more like a chalet kind of place and not a luxury hotel, yeah? HARRIS Café, the signature restaurant in the resort, is where you will most likely dine in unless you plan to eat out for all three meals of the day. The place gives off a homely ambience with the bright yellow pillars, orange chairs, friendly staff and panoramic view of the pool. While we were waiting for our room to be ready on the first day, we hopped by for some quick pizza and I must say it was really quite yummy. 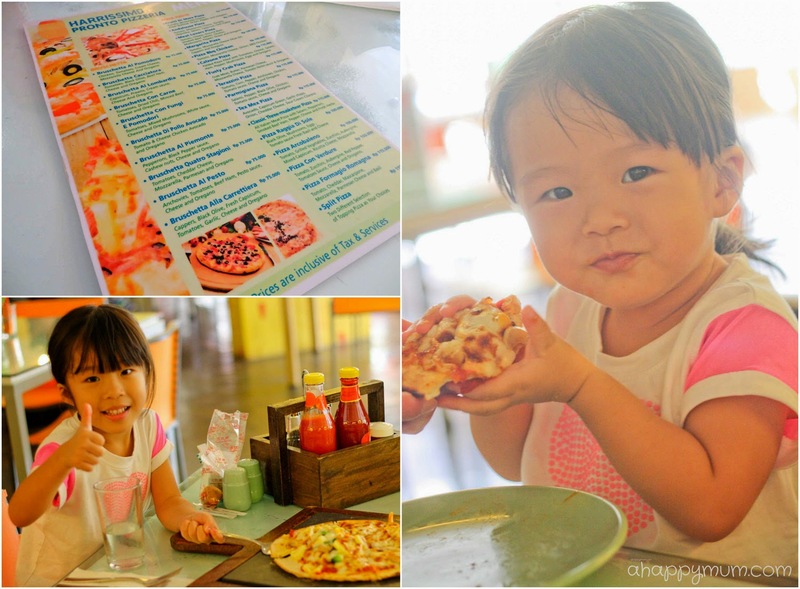 In fact, I do think I prefer its pizza menu over its lunch buffet and not surprisingly, the kids were happy we chose to go with the former. I would have loved to try out the New Zealand steaks at the newly opened H Grill & Bar, which is an al fresco seaside casual grill and bar. 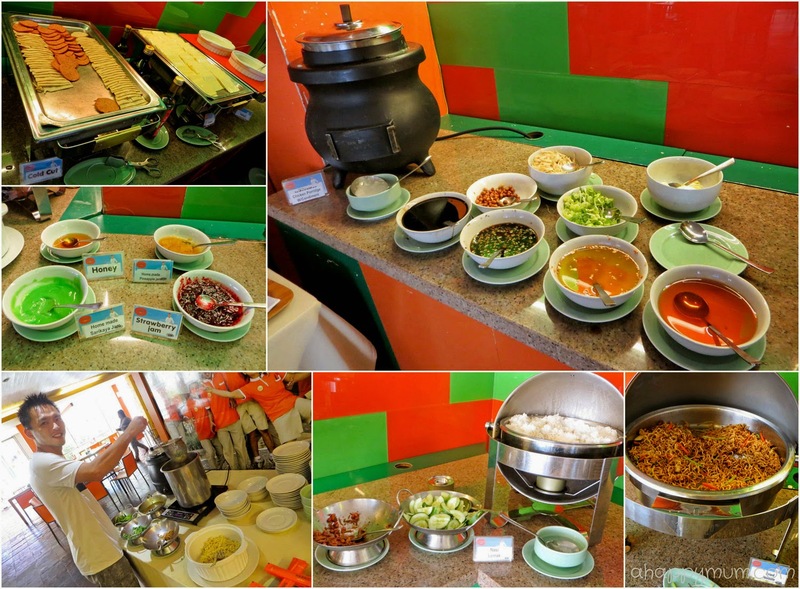 However, it was closed when we were there and thus we settled our first day dinner with a dinner buffet at HARRIS Café and on the second day, we decided to opt for room service so we could laze in the comfort of our spacious room. While I wouldn't say the food was bad, it also wasn't that exciting or impressive. Especially after we just had a seafood lunch at a kelong restaurant in Barelang (more to come on that in a later section). 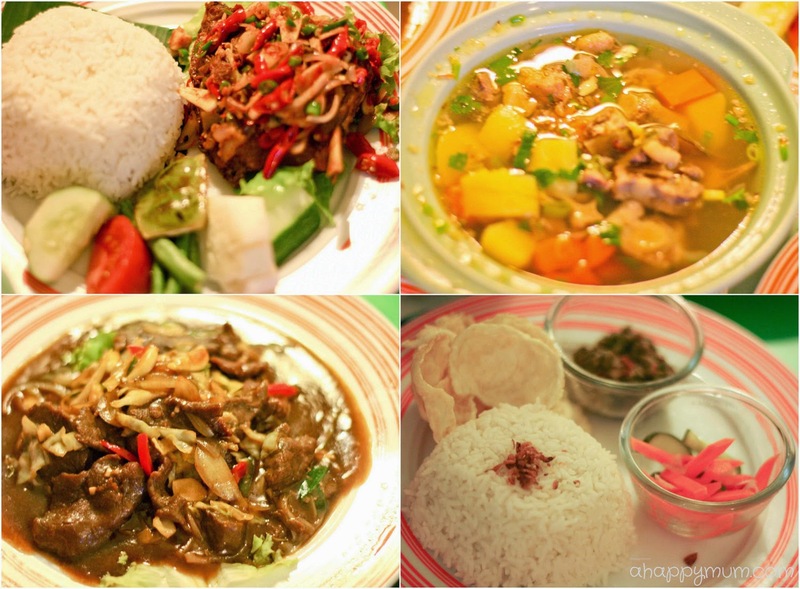 If you do eat at HARRIS Café, my recommendation would be to go À la carte and try the Bebek Balado (Deep fried duck with red chilli paste) or the Sop Buntut Rebus (Traditional Oxtail Soup). Or, to be safe, just go for pasta or pizza. I do think that breakfast is an important meal of the day so I was glad that the girls got their tummies filled before we went in search of more adventure. Now, for the fun part of our stay! I have to first show you more pictures of the awesome freeform swimming pool since it was one of the favourite parts of our stay. If I have to say it again, this pool is HUGE! Like really huge. It was also very inviting to swim and from the moment we saw it, Ariel would keep dragging us there and even attempted to take off all her clothes so she could jump in. Not kidding. I love the unique, beautiful design of the pool and kids can have fun crossing the bridge, throwing some hoops, shooting goals or simply have fun in the wading pool. As for the adults, if you are not a fan of the hot sun, then you can always opt for the outdoor lounge beds which come with a canopy so you can rest in the shade and read your favourite book while keeping an eye on the kids. My only wish is that if this place had slides for the little ones, everything would be even more perfect! In any case, do remember to bring along some water toys for your kids and they'll be kept really busy and happy. At HARRIS, the fun never stops for the kids. That is because the Dino Kids Club has an abundance of fun activities to offer these young guests every single day! From hand painting, movie screening, fun fishing, cooking classes to games and more, you bet there is plenty of things to keep the kids entertained. Although you can find a list of the activity program in the room catalogue, we realised that they are subject to changes and thus it is best to head over to the club to check with the staff on the actual timings and activities. Just so you know, the resort is pretty big and so it can be a short walk to get from your room to the Dino Kids Club, which is located at the ground floor of a building where all the indoor facilities are housed. 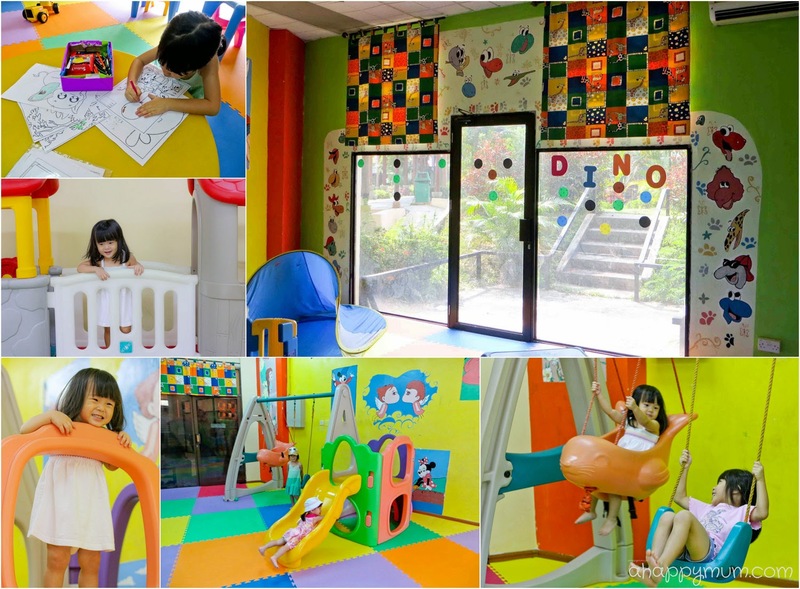 Inside the club, you can find toys, slides, swings and colouring materials for the children to play with. We were there on a Sunday afternoon and other than a couple of staff, the whole place was empty! You bet that made the girls shriek with joy to think that they could have the whole playground to themselves. The activity that thrilled us the most at Dino Kids Club was the fun fishing. You know, the funny thing is the hubby and I were quite skeptical when we heard it and so we asked the lady "Fishing as in fishing? Not with toy fishes?". She must have been very amused by our question from the way she laughed and assured us by saying "Yes, they will get to fish real fish." So, at 4pm, we made our way to the pond armed with bread and fishing rods. Not surprisingly, this place had more mosquitoes than we would have liked but I tell you, for that first fishing experience and that sense of achievement on the kids' faces, it was definitely worth it. Just so you know, anyone and everyone will be able to catch some fish because it's really easy! Don't believe me? Well, Angel caught 12 on her own! Of course, it is only nice to release the fish back into the pond and that was what we did. Even the little sister caught a couple of fish and boy was she ecstatic about it! Now, since HARRIS is a family-friendly holiday destination, there's bound to be some enjoyment for everyone. 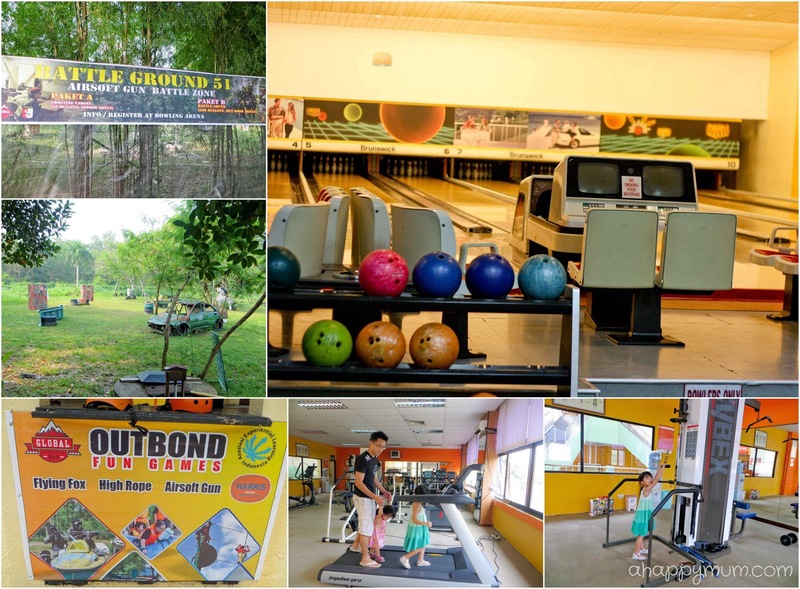 Apart from the kids, adults can also choose to play or indulge in some of the indoor activities including a spa with 31 treatments available, paint ball, bowling, shooting targets, foot reflexology, fitness centre, billiard and so on. For the first time in a long while, I allowed myself to be away from the kids and went for a 60-minute traditional Indonesian massage. It felt really awesome to relax those muscles after so long and I do think the short session had a powerful, therapeutic effect on me. You know, I would have loved to try out the outdoor paint ball or air soft gun battle if we had enough people to form a team. Nope, not keen on teaming up with the kids and fighting against the hubby. 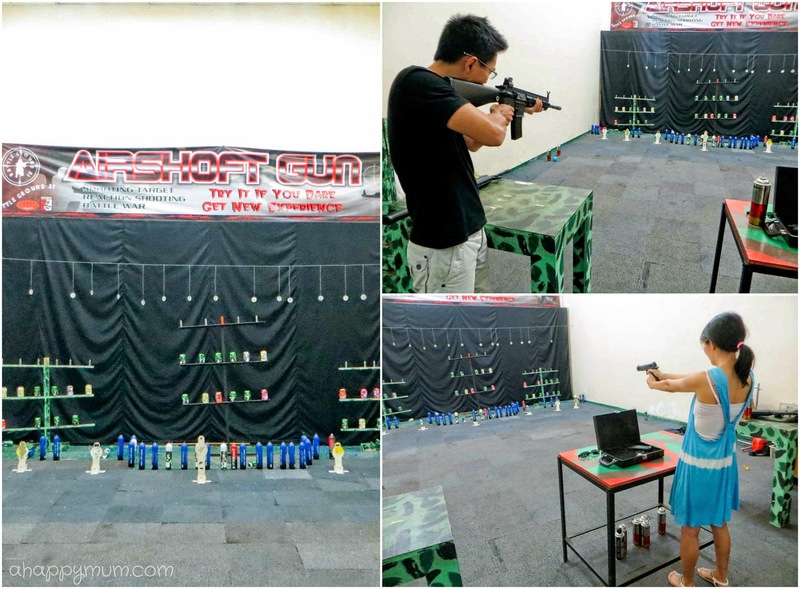 So, I had to be contented with a short 10-minute shooting target session where the hubby and I fired 50 bullets using a rifle and a pistol. I must say we did really well and I kind of think I'm not that bad compared to the marksman because he was pretty impressed that I managed to hit even a small silver coin! If you are more keen on outdoor sports, then you will be glad to know that HARRIS also offers activities like banana boat rides, cable skiing, canoeing, flying fox and ATV motor ride. Previously, I would have loved to try these out but with two young kids who are unable to enjoy any of them, plus considering that the whole of Waterfront was rather peaceful and uneventful on weekdays, we decided to just head to a nearby quiet part of the beach near the swamps. I have to say that the water appeared a little murky and swimming is probably not allowed at the beach. Not that we would think of swimming here when we had the fantastic pool at our doorstep. But guess what, we found treasure at the beach! By that, I do mean crabs, mudskippers, shellfish, snails and even starfish! These were gems in the eyes of the kids and we managed to see so many of them at low tide which really thrilled everyone. For me, I feel blessed to have a hubby who not only is great at spotting even the tiniest living creatures, but he is always there to accompany and impart general knowledge to the kids when we are at the beach. 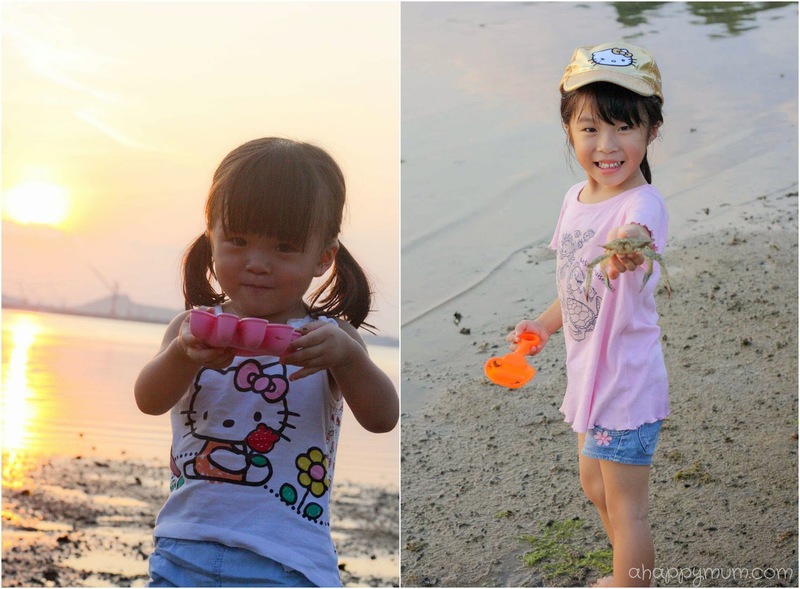 And to have two girly girls who are yet not afraid to step into the sea, dig in the mud or even hold a crab with their fingers, I think that is even more awesome. After every visit to the beach, we went back to the resort with dirty feet, sandy clothes and big smiles. Honestly, when was the last time we slowed down our footsteps to breathe in the fresh air, get close to mother nature and enjoy the simple joy that life has to offer? I really think we should do this more often. Being a small city in Batam, you don't expect to see many attractions or places of interest in Waterfront or its nearby surroundings. If you are into shopping, you can consider taking the bus shuttle from the resort to Nagoya Hill, which is the biggest shopping mall in Batam and even catch a movie there. The shuttle only runs once on weekdays and twice on weekends, and costs around S$10 per person for a 2-way ticket. For us, we chose to go sightseeing and headed to one of Batam's most famous icons - Barelang Bridge, which was a 20 minutes drive away. The Barelang Bridge is a chain of six bridges that connect the islands of Batam, Rempang, and Galang. The full stretch of all the bridges total to two kilometers and the distance from first bridge to the last is about 50km long which takes a travelling time of about 50 minutes. 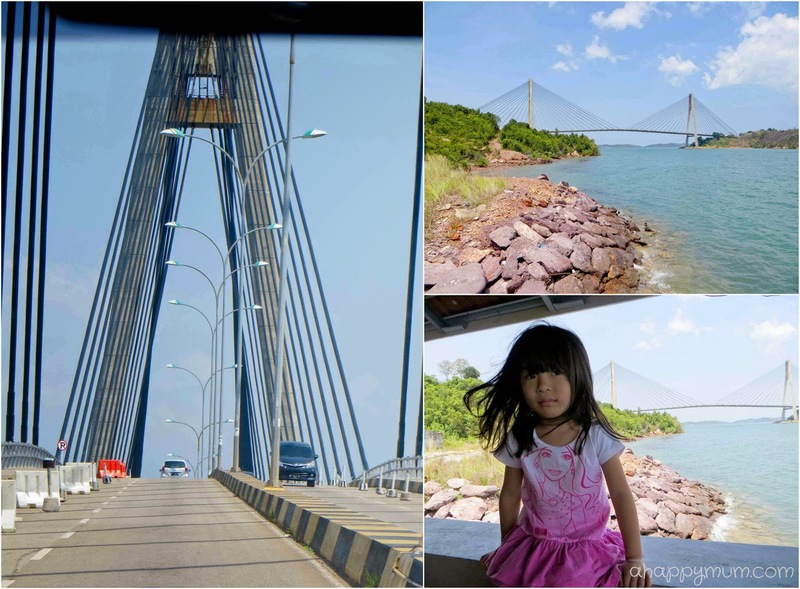 Well, for practical reasons, we did not make it to the last bridge and were contented to just see the cable-stayed Tengku Fisabilillah bridge that connects Batam Island and Tonton Island. 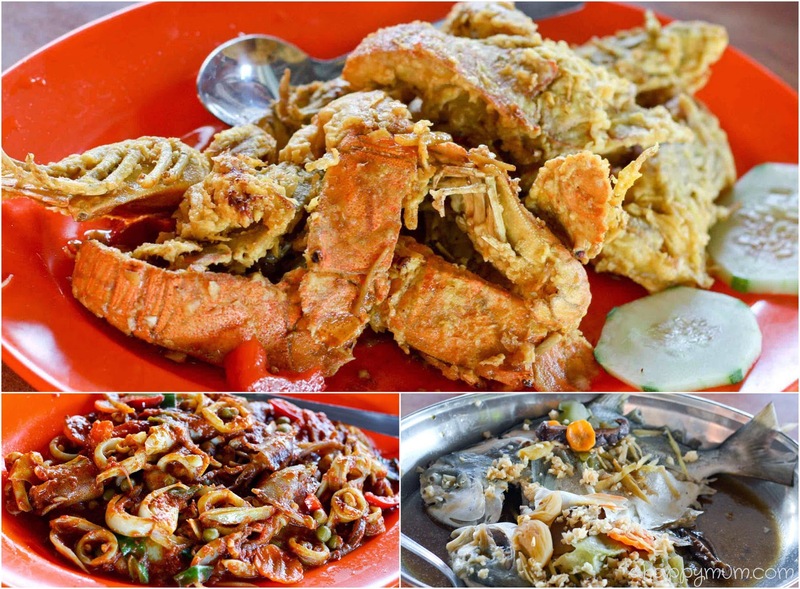 What we were more interested in was the Barelang Seafood Restaurant as our stomachs were growling after a morning swim, plus a visit to Batam is never complete without a good seafood meal. Touted as the biggest seafood restaurant in Batam (yes, this place is enormous), we were delighted to see that there was a kelong where all the live fishes were kept. A quick check with the staff revealed that we could choose the seafood we wanted and get the chefs to cook them right away. Now, talk about freshness! There was a wide selection of seafood including lobsters, crabs, squids, prawns, crayfish and many types of fish! The kids were really excited to walk around looking at the fish and observing how they were caught. Why, thanks to a nice uncle, Angel even got to fish while we were waiting for the food and she caught a tiny little fish which we let back into the sea. It was time to tuck in! We had with us our friendly hosts from HARRIS who were so kind as to show us the way to this part of the island. In fact, they said they had never eaten the live seafood from the kelong here and so it was our pleasure to treat them to a delightful meal. To me, it's not just about blogging or advertising, it's also about making friends from all over the world and I was glad I got to know them better through a hearty chat about kids, family, education and cultures. Our picks for the day were crayfish, squid and pomfrets along with an egg dish, tofu dish and vegetable dish. All these, including drinks like fresh coconut and beer, cost us only S$60 which the hubby said was really inexpensive. We did wish that there were less flies interested in our food because it seemed like we had to shoo them every five seconds or so in between eating, talking and feeding the kids. Nonetheless, it was a fun-filled and enjoyable afternoon outing for us and we were really thankful to have been there and done that! It's not often that I get to take nice sunset pictures so I'm sharing with you more of the awe-inspiring beach scenery. The beautiful yolk not only heated the waters and the sand, it warmed our hearts so deep that we will remember this place for a long, long time to come. Carefree days. Relaxed minds. Peaceful life. Loving family. We did nothing much but we had everything we needed and more. Not surprisingly, we returned home with renewed souls and happy hearts. 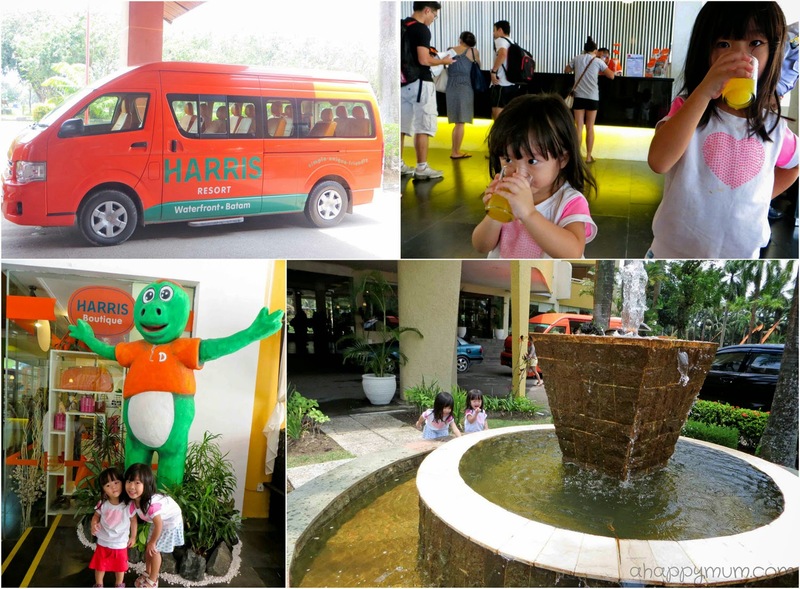 Thank you, HARRIS Resort, for the precious memories and wonderful holiday you gave to us! Now, how does a couple retreat and spa sound to you? 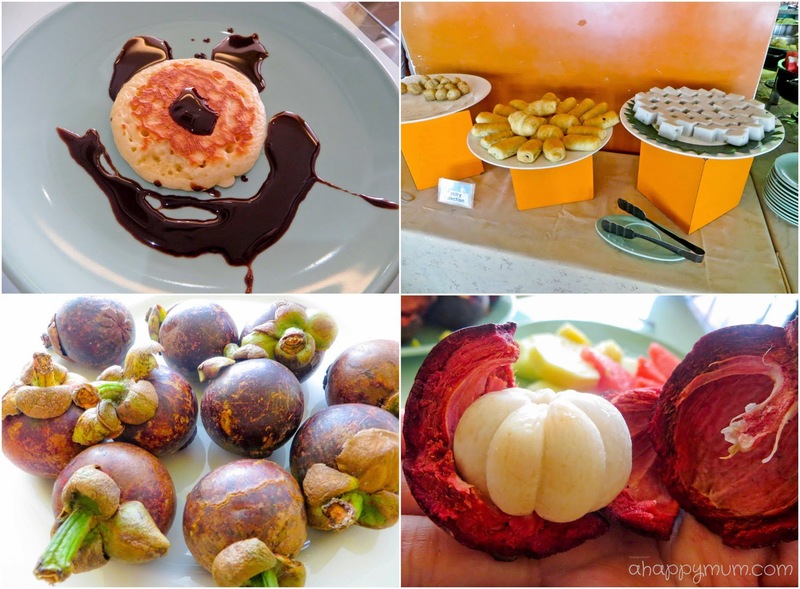 As always, I'm happy to be able to share good things with my readers so if you are interested in a getaway to HARRIS Resort Waterfront Batam, here's your chance to win! - Valid from 13 Oct 2014 to 12 Jan 2015. - Can be used for both weekdays and weekends (exclude Public Holidays). - Accommodation dates are subject to availability. Blackout dates apply. - Original voucher must be presented upon arrival and is not transferable. - This giveaway is open to readers worldwide and two different winners will be picked. - Children under the age of 12 (maximum two children per room and using the existing bedding) will be accommodated free of charge if sharing with one or two adults in the same room. - One extra bed can be added at S$35 and includes breakfast. - For an upgrade to the Family Room (which is the one we stayed in), it will cost an additional S$40, including breakfast for everyone. - The above is subject to confirmation and for more booking, pricing or room information, the winners will need to contact HARRIS Resort directly. 1) Leave a comment at the end of this post with your name, email address and tell me the activity you would most like to do at HARRIS Resort Waterfront Batam. 2) 'Like' HARRIS Resort Waterfront Batam on Facebook here. Indicate in the Rafflecopter widget that you have done the above steps. To gain more chances of winning, you can choose to follow the rest of the options. Best of luck, everyone! 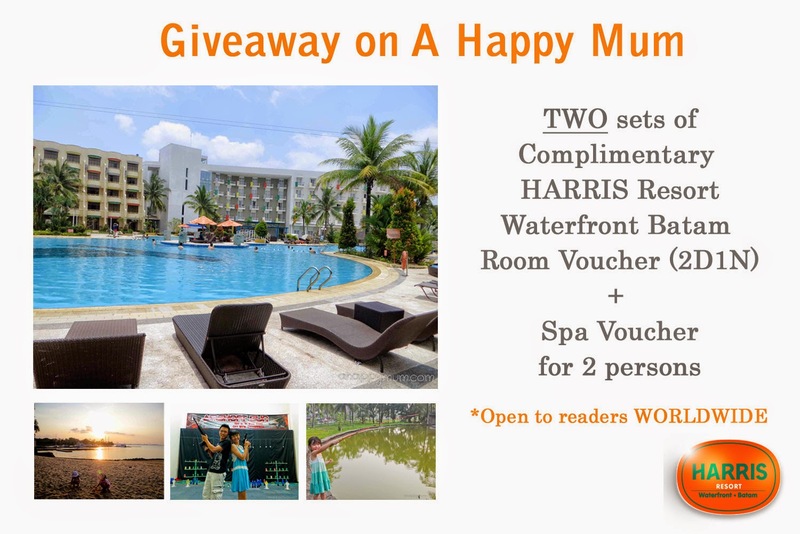 Disclosure: A Happy Mum is the first family blogger from Singapore to be sponsored by HARRIS Resort Waterfront Batam and we received a 3D2N accommodation in the HARRIS Family Room. 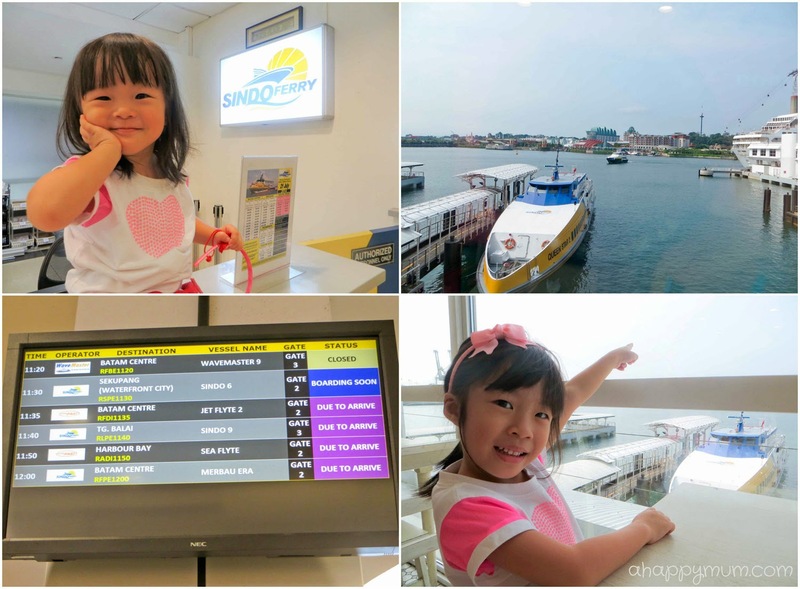 All ferry transport, meals (excluding breakfast), spa and activities were paid by ourselves. All opinions are our own. we want to swim in the clean and clear swimming pool. we want to play in the Dino Kids Club! Time for our first family getaway and Harris Resourt Batam could be the place! having to enjoy mother nature once again and the tranquility of the beach where the sound of the bursting city and the hectic load of studies are all enclosed at the back of my mind. We would love to visit Harris resort and swim in that beckoning pool! We woild love to do the fishing activity! The kids will be thrilled to have a go at fishing with minimum fuss! The activity I would most like to do at HARRIS Resort Waterfront Batam is to have an awesome getaway time in the swimming pool!! Splash! Splash! Splash! We stayed here twice, once with my girl and once without, love it! Am going to Batam again over the Christmas holidays but we're staying at the sister hotel, Harris Hotel as it is nearer to the mall. Chill at the pool. The kids will love the dinos kid club. To swim as a family!! Definitely will be swimming at the pool. My kids love water. I would love to "spa" all the way like there is no tomorrow! Swimming in and lazing by the pool sounds just fantastic. We would love a short getaway on the coming school holiday.. 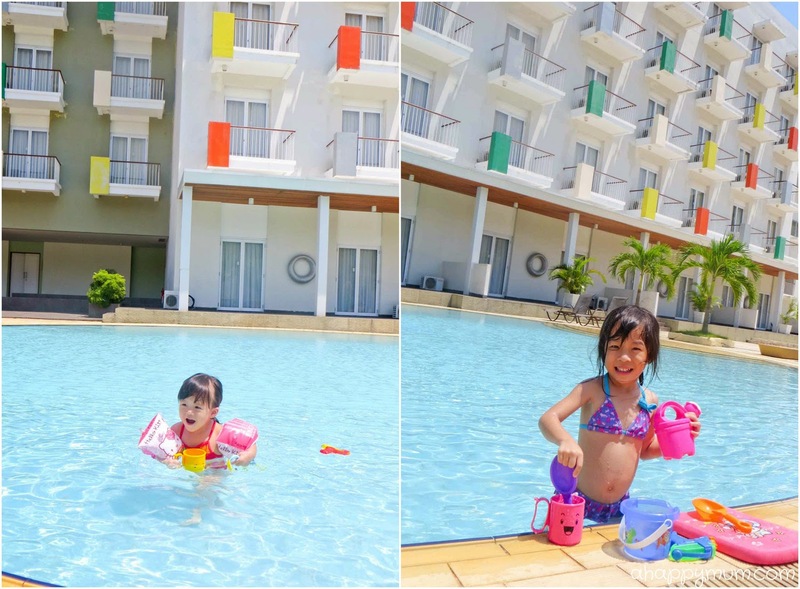 I think Harris Resort is a nice place to bring kids, especially both my girls love swimming. So many wonderful family activities that we can do together at Harris. Love the Dino Kids club which helps to keep the kids occupied while we chill out. A very thoughtful giveaway! I'd love to swim, indulge in a pampering massage, check out the beach, and eat the fantastic pizzas! Would like to do fishing with my family because we have not done that before! Thanks for the giveaway! Thanks a lot for awesome giveaway.. Thanks for awesome giveaway! Would love to dip in the pool with my 3 sons! 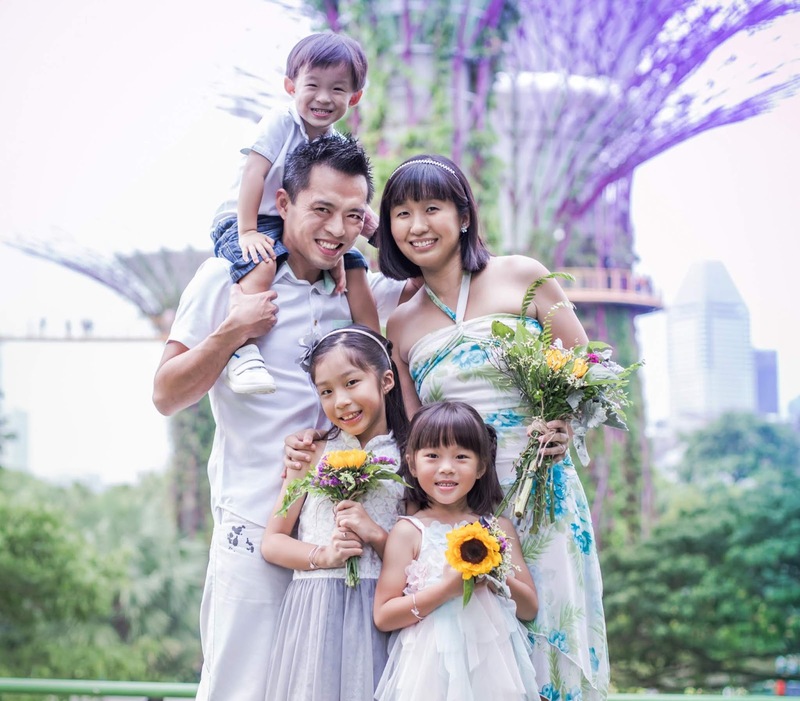 Recently had a new addition to the family and looking for family-friendly places to bring my 2 little ones, especially to the huge swimming pool as both of them love water! Oh, the spa, for sure! Tye Dino Kids club looks pretty awesome! Would love to have a go w my son! I would love to go for the spa and massage while my kids can join in the various Dino Club activities. My boy loves swimming in the pool so our family bonding is swimming in the pool or beach. I would love to go swimming at the Harris Resort Waterfront Batam with my son and hubby. I'm looking forward to bring my water babies to enjoy the pool! I wanna let the kids try fishing! The best to do is swimming together with my family. I trust we will surely have fun. And i want to show crabs, mudskippers, shellfish, snails and even starfish to the kids. I believe they want to meet them ;). I would like to bring my kids to the Dino Kids Club. Seems so fun!!! Definitely lounging by the pool all day long although Liam would probably want to hang at the Dino Kids Club the most! nv been there before.. and my kids love waterplay. kids can get to enjoy sun, water, dino club while adults can relax.. nice short gateaway! would love to win it! I would love to let Dana and AJ play on the beach and watch the sun set together :) Thanks for hosting this spectacular giveaway. We like to swim there and relax. I am sure my boy would enjoy the pool as much as your girls. We would definitely have a leisure time in the pool! We like to enjoy at the pool. Activity that I most like to do at HARRIS Resort Waterfront Batam: The outdoor paintball. It looks cool and fun to shoot paintball at each other! It will encourage family bonding and great way for kids/adults to de-stress too! We would swim at all the times possible in the pool! Thank you Summer for hosting this giveaway! I would like to let the kids enjoy themselves at the Dino Kids Club. I would love to walk on the Barelang Bridge! I would like to go for swimming with my family. Hope to win to go for fishing with 3 kids and hubby! 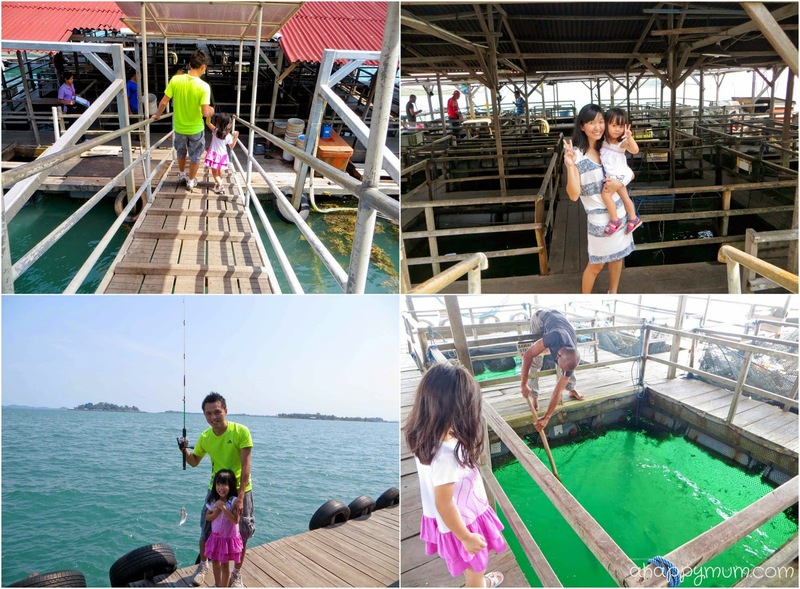 I will love to try the fishing activity with the kids and enjoy swimming at the huge pool. One of the activity I would love to bring my 2 son for sand play!! They will be surprise by some mini crab found in it! And kids would love swimming!!! I want to have an enjoyable spa with my love as we need it to relax ourselves from our wedding preparation. 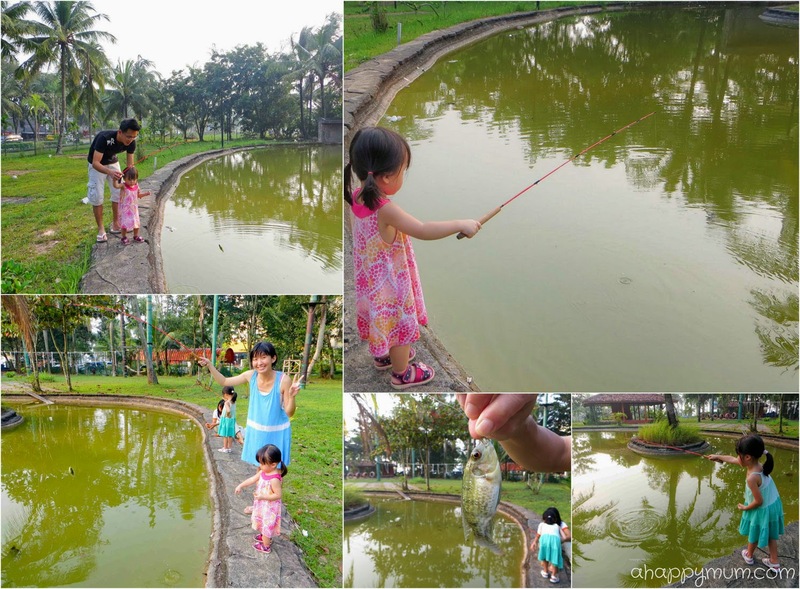 I would the fishing activity as my kids always like fishing pond and they will be thrilled to be able to fish! The beach! 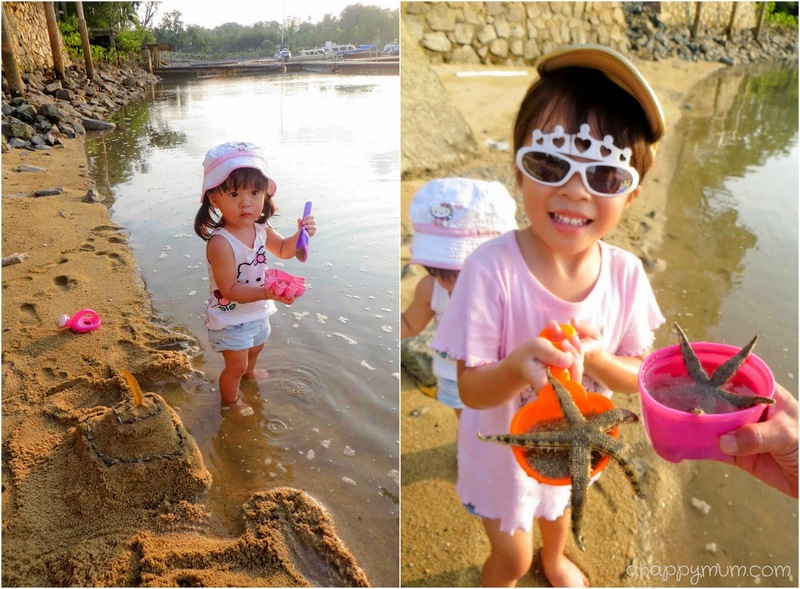 My kids love the beach...and we have not been to Batam before! Spa and seafood dinner at the kelong sound like just like the right ingredients for a perfect holiday! OMG the last time i been to Harris Resort was 10yrs ago with my hubby (then boyfriend). The resort was nothing near family-friendly. The restaurant was in dilapidated condition. We didn't go to the beach. We only went cart-racing and shopping. 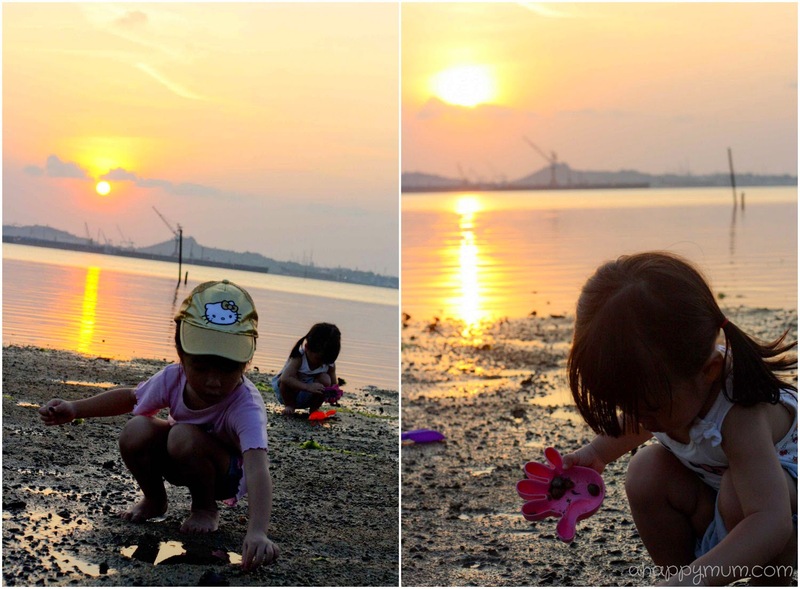 I am so keen in bringing the kids for pond fishing and also the beach walk. How to plan for low tide at Batam? I want to bring them to see all these wonderful marine animals!!! *excited* This is a fantastic review. Thank you for the recommendation and bringing this awesome giveaway. Hope to plan a short holiday soon. Swimming in the pool & fishing with the kids sounds great! Love the beach and sunset! Hope to bring my family there! Thanks for hosting the giveaway! I would certainly love the pool and massage there..hope to go for a couple weekend or a family one. Never been to Batam before. Would love to bring the family for a stay! I NEED to eat me some real good seafood and then head to the beach with a nice cool mug/can of beer. I nong time no relak one corner liao wor so this will be such a nice change from my boring daily routine! I definitely need that beach therapy!!!!!! Have cheap and good seafood dinner with my family! Your short trip sounds too good! Even if I am not the lucky one to win this, I'm definitely going to list this down as our next short trip destination. Looking forward to laze by the pool and beach and have seafood! I want to go swimming and eat yummy seafood! I've been to the Harris Resort years back with my hubby, seems like they have since added a lot more activities and facilities. Too bad, I will be on confinement for the period of your offer. Do hope to have a chance to visit the resort again when the incoming little one is big enough! outdoor paintball because we've never tried it and it looks so fun! thank u! Name:Nikki Yeo Email: nikkiyyl@hotmail.com thanks! I want play all outdoor activities with my family to create many precious memory!! I can imagine my kids' delight upon setting foot into the hotel... the pool, the beach, the bowling, the shooting & fishing!!!! ENDLESS FUN!! wow ! Harris hotel is my fav ! hope to win this for my family ! I'd love to try the banana boat ride. The air soft gun shooting looks fun! Would love to try it! I want to win this so I can pamper myself and bring my baby girl for a short getaway and bond with her at the same time. I have a hectic schedule. I work study and a full time single mum. I hope to win this for my two little girl, they are 5 and 10 years old, they make me to be happy mum, I love them so much!! would love to be there with my husband & girl! Wonderful experience which is a must have !!!! Thank you for sharing! Hope to win this for our first holiday (after i became a sahm last year)! My kids, 3 and 5 would love the swimming pool and the fun fishing! Thank You Happy Mum for sharing with me! 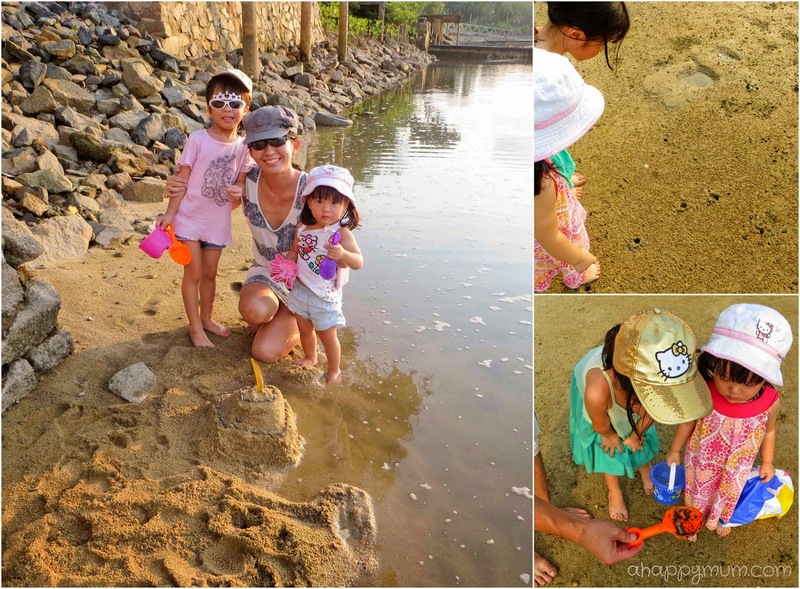 Fishing and build a mud castle with my princess..... she never have a real fishing just because her mummy...... me need to work hard... ^^ Thank you.